Munich (in German: München), the charming historic Bavarian capital, is spectacularly close to the snow-capped peaks of the Alps and packed with bustling beer halls, enchanting cathedrals and artsy museums. The cobbled streets, cafe-lined alleys and beautiful architecture lend themselves to a quaint, but sophisticated, small-town atmosphere. After a delightful breakfast near my hotel with a Dutch girl from Amsterdam whose train to Verona was delayed, I begin my walk down Kaufingerstraße, one of the main shopping streets in the city. It’s early March, and the morning is sunny and cool, the skies clear and the streets are full of people. The way is lined with upscale stores and ornately decorated building facades. 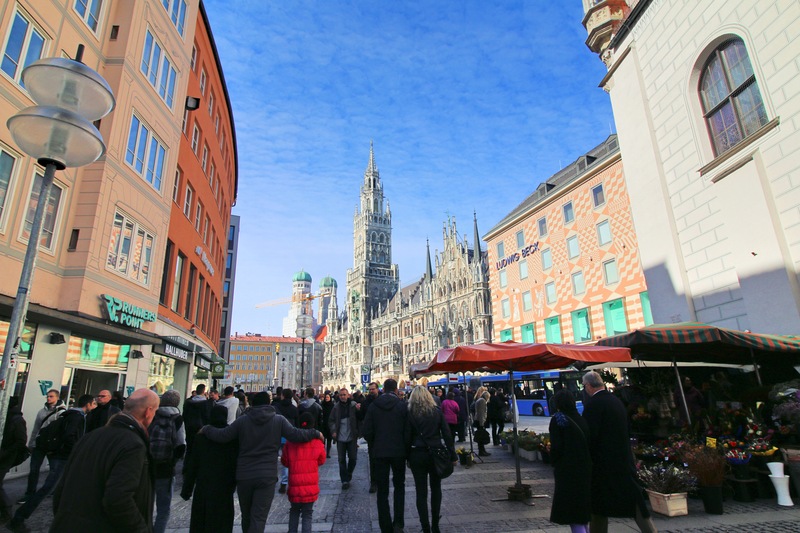 Being much too poor to even think about buying anything, and eager to see the rest of the sights, I head for the Marienplatz, Munich’s historical centre and the hub for visitors to begin their exploration of the city. For centuries the Marienplatz has been the city’s central meeting square – framed by the Gothic New Town Hall and its towering Glockenspiel, it is the focal point of festivals, protests and celebrations for the people Munich. I join an English walking tour (http://www.munichwalktours.de/en/the-city-walk/) with a nice German woman with a thick Bavarian accent, and we set off. We don’t walk far, moving to a better vantage point in the plaza to watch the lengthy Glockenspiel show that begins at 11am. It’s cute, musical and a charming spectacle illustrating one of the events in Munich’s past, but I’m eager to get moving and its too cold to stand still for long. We head towards the Frauenkirche, Munich’s imposing and iconic cathedral. Our guide tells us the cathedral was built in only twenty years. 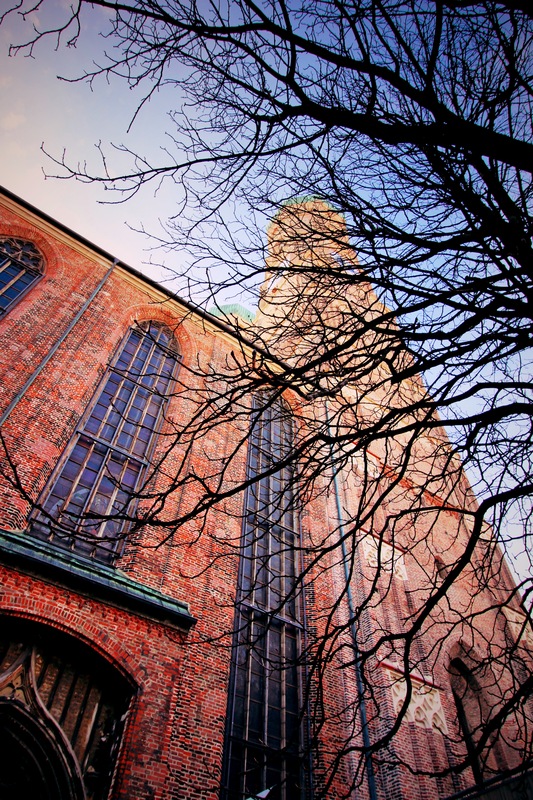 There exists a myth, she continues, about the architect Halsbach, builder of the Frauenkirche. See, Halsbach wanted to finish the cathedral quickly, to impress the Pope. The Devil appeared, and offered to make a deal with Halsbach. The Devil would send his unholy demons to help with the construction, if Halsbach designed the church to have no windows. The Devil intended to play tricks on the parishioners in the darkness. Halsbach agreed, and the construction was completed with haste. When the Devil arrived to survey the windowless church he was tricked by Halsbach, who had built the pillars of the building to block the sight of the many windows. The Devil, unable to enter the consecrated site, stamped his foot in unbridled anger in the foyer and disappeared. His footprint, emblazoned on the stone floor, still remains. As we leave the church through the imposing wooden doors, a slight breeze stirs. The guide further continues – it is said that in his hasty retreat, the Devil left behind his favourite steed. This breeze, she tells us, is said to be the lost demonic horse circling endlessly and waiting for his master to eventually return. Feeling inspired by this fantastical mythological account, we leave behind the twin towers of the cathedral and head towards the Odeonsplatz, a large square packed with people. This public square was sight of Hitler’s failed coup in 1925, resulting in him being charged with treason and being imprisoned. This is the first time the guide speaks about the Second World War and the Third Reich. She tells us that the people of Munich, and of Germany, for a long time pretended the war never happened and chose not to speak about it. This surprises me, given Hitler had history in Munich, and that over 80% of the city was destroyed by Allied bombing runs. An aura of healing since reunification, she says, has changed this however, and most German people want to show that they are dealing with this unfortunate part of their history. At one end of the square is the Field Marshall’s Hall. During the Nazi reign, a memorial for Hitler’s supporters killed in the coup was erected and kept under constant SS guard. Our guide tells us that the people of Munich were forced to salute the memorial as they passed – those who refused would take a longer route around the Odeonsplatz through what became known as ‘dodger’s alley’. The impact of the Third Reich permeates every piece of trivia our guide tells us about the city – the feeling of standing amongst so much wartime history is thrilling and humbling and sad. Listening to the accounts of the monumental loss of life, destruction of historical architectural wonders, makes the tour all the more poignant. We next head through the icy and dull Hofgarten, past the Residenz and stop in front of the Bavarian State Chancellery. Completely destroyed in 1945, the building was reconstructed completely in glass – as the guide tells us, the construction material symbolises the new transparency of the new, post-war German government and the hope that the unchecked rise of a radical party like the Nazis, will never be allowed to happen again. We continue to one of the largest metropolitan parks in Europe, the Englischer Garten. Here we are treated to a fascinating and unexpected sight – surfing! A man-made river provides locals with cascading 2 metre waves. The three brave surfers attract large crowds of onlookers. I have to admit, it’s exceedingly fun to watch them catch the waves. A brief walk around the park (it’s so massive you’d need a whole day to explore it fully) and the walking tour concludes. Surprisingly the group of Americans who started the tour with me have all left, leaving me with a tour guide all to myself! She walks with me back to the Marienplatz, and suggests I check out the tower of St Peter’s Church. Admission to the tower of St Peter’s costs about €3 – the real cost is climbing the 299 steps to the small belfry that rises 91m above the city. But it’s well worth the effort! I start the climb, confident that it’ll be easy. The stone spiral stairs, the tiniest I’ve ever seen, are not only for those ascending the tower, but also those descending. They get crowded quickly. Twenty minutes later, breathless and glad to be at the top, I emerge onto a tiny platform surrounding the tower. The view is simply amazing. Stretched out before me is an orange jungle of roofs, church steeples and cathedrals, the snow-capped mountains just visible on the southern horizon. I spend fifteen minutes up here, taking photographs from every cardinal point. The photographs don’t do the scene justice – it’s hard to capture the clear blue sky and the crisp Bavarian atmosphere. Descending the tower takes just as long as it did to ascend. It’s 4pm by the time I get back the ground, and I’m still eager to get to another site before it closes – the Deutsches Museum – it’s the largest museum of science and technology in the world. As a science nerd, it’s a must-see on my list! Located on an island on the river Isar. I arrive just before the last entry and head immediately to the chemistry and microscopy exhibits. From the world’s first electron microscopes, historical aircraft, microelectronics, biotechnology and space exploration, the museum is three floors of scientific achievement highlighting the best industrial advances of the past three hundred years. I could easily spend a day here, but sadly the museum staff announce closing time and start herding people to the exits. I resign myself to having to return one day. The sun has begun to go down, and with it, the temperature. With light fading fast, I have just enough time to grab a coffee and take a leisurely stroll along the banks of the river, reflecting on the amazing city I’ve been lucky enough to explore. Surprisingly, the sandy banks are host to a number of locals, walking dogs, sitting on picnic blankets and enjoying the last rays of sunshine for the day. It’s peaceful and the sound of the river as twilight descends on the city steadily fades as I head away and back to the Marienplatz for some dinner and some attempts at night-time photography. There is always something that draws me to landmarks after dark – the texture of the building changes when its lit up by artificial lights, its character differs from its daytime persona. The gothic-style Town Hall is one such landmark – it’s 10pm and the plaza is now largely deserted, the orange-yellow glow of street lights creates a feeling of warmth in the brisk evening air. The four statues of Mary’s Column, depicting the angels wrestling with the adversities faced by the city throughout it’s 850 year history (war represented by the lion, pestilence by the cockatrice, hunger or famine by the dragon and heresy by the serpent), are eerily bathed in the shadows and look even more terrifying then they did during the day. It’s getting late, and I’ve got an early train to catch. I manage to translate the underground map and find the way back to my hotel. My feet are absolutely killing me (pro travel tip – wear comfortable walking shoes), but walking around this magnificent city was definitely worth it. The friendly atmosphere, the bustling streets, the amazing history and Bavarian charm of the city have won me over – I’ll definitely be visiting again! Thanks so much! I found it to be a wonderfully beautiful city! Probably my favourite city in Germany!